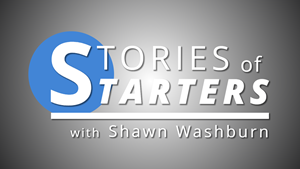 Welcome to the Stories of Starters Podcast. The show dedicated to helping you build your dream, pursue your passion and make a difference. Stories are how we share information. They teach us, encourage us, inspire us, challenge us, engage us. Starters are men and women like you who have a dream inside that needs to take shape, a passion that they want to share with the world. What is your dream? What drives you? What do you find yourself thinking about doing one day? This podcast is for you, no matter what side of the Starting Line you’re on. Whether you’re still trying to put the pieces together to make something happen or if you’ve already launched and are looking for encouragement from like-minded Starters. You’ll hear interviews with authors, designers, craftsmen, chefs, photographers, pastors, videographers, cafe owners and more. Entrepreneurs, side-hustlers and non-profit founders just like you. To get notified when the podcast launches and each episode comes out, join my email list by entering your name and email in the Subscribe box. I can’t wait to connect with you. If you’d like to be featured on the podcast or know someone who would be a great fit, reach out to me on my contact page and let me know. To check out show notes for each episode, head to the Blog page.